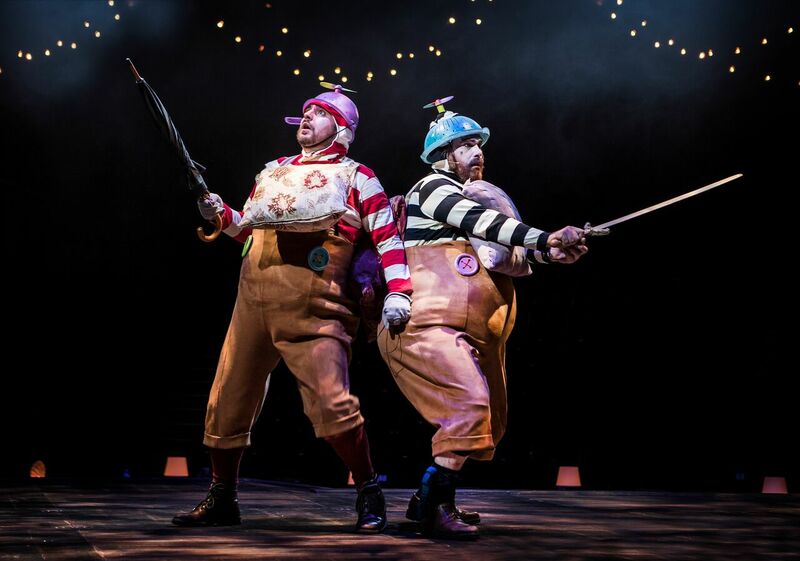 The Christmas Shows at Northern Stage have been one of our real Christmas highlights over the past three years. They just seem to get better and better with Get Santa, The Wizard of Oz and James and the Giant Peach all receiving super high praise from us. I was therefore super excited about this year's performance of Alice in Wonderland and could not wait to see what was in store. Theatre at Northern Stage is nearly always an immersive experience and your enjoyment will begin as soon as you step foot into McKenna's bar. With hints to the performance everywhere you look, I almost expected a white rabbit to pop up behind the bar. It's the perfect place to enjoy a pre-show or interval drink (and they serve mulled wine!). 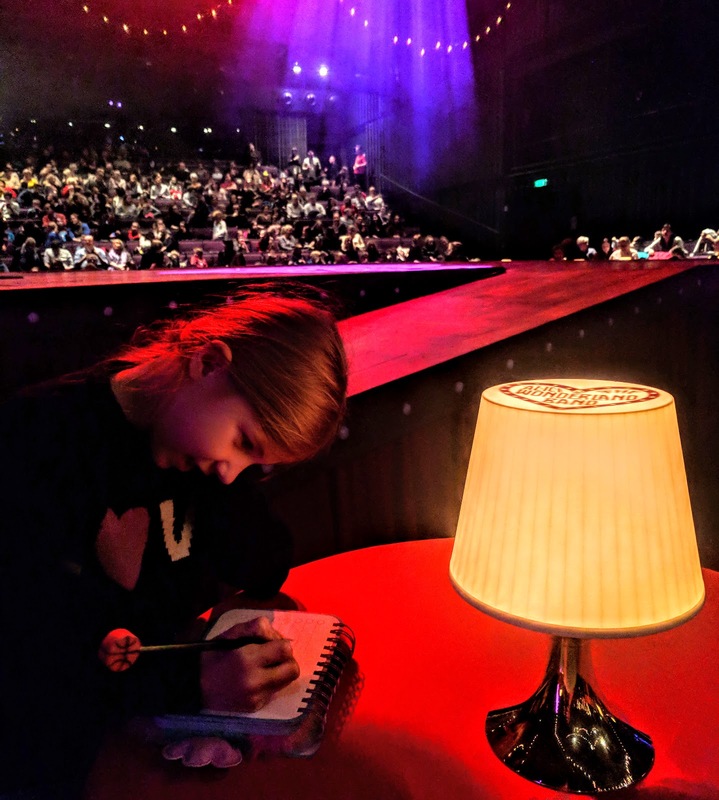 We were lucky to be seated in the front row seats which are little tables with special Alice in Wonderland lamps on them. You really feel as if you could be sitting in a French cabaret and not in a theatre in North East England. Alice in Wonderland uses the whole theatre - you could find some of the cast joining you at your table, there will be balcony scenes and actors appearing through the crowds when you least expect it and popping up from under the stage at various points in the evening - definitely a feast for the eyes. Alice in Wonderland is an utterly bonkers story anyway but this show is even more surreal. 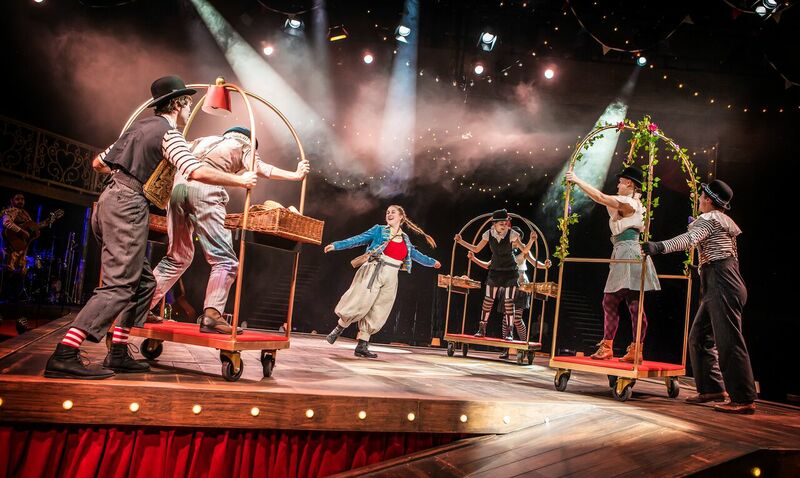 The stage switches from a boat to a rose garden and a tea party with ease though thanks to the clever use of staging, props and lighting. Personally, I thought the second half of the show was so much better than the first. The first half missed those comedy moments and fantastic characters I'd come to expect from a Northern Stage show and I watched Heidi get a little fidgety at times as the story unfolded. 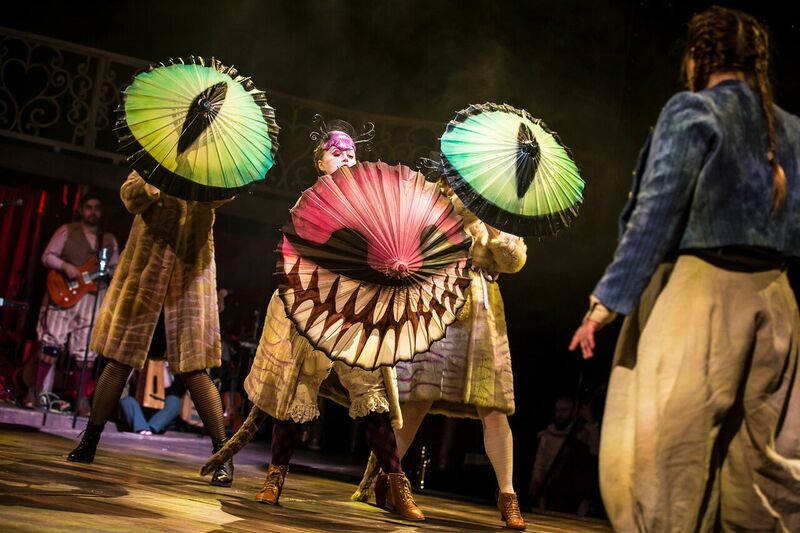 The second half was where the performance really excelled itself, I love, love, loved the Cheshire Cat and really want my own Cheshire Cat umbrella now. Clara Darcy who plays the Cheshire Cat, Mad March Hare & Ma was really the star of the show for me. How somebody can transform into a cat with just the help of an umbrella is beyond me but she managed it with ease. The Mad Hatter's Tea Party was everything you wanted it to be and more - Chris Price was another star performer and his portrayal of the Mad Hatter was spot on for me. The Tea Party returns for the Queen's feast at the end which is where you'll see the magic of Northern Stage unravel - no spoilers but everyone will love it. There is plenty of audience participation in the second half too and the whole theatre ended up joining the Mad Hatter and swaying their arms along to his song. An unexpected star of the show is the Double Bass-playing Dormouse. He was so sweet and Heidi and I immediately fell in love with him. We especially loved his story about treacle (yes very random but this entire show is random). Alice, Tweedle Dum and Tweedle Dee and the two Queens were all very good but in all honesty, I do think they did not compare to the characters I've loved over the last few years. I didn't really feel any affection towards Alice or have the urge to mother her and as everyone knows I love a good bad guy but I didn't want to hate the Red Queen in this version as much as I love to hate Helena Bonham Carter in Tim Burton's live-action version. Heidi, Harry and Jack all really enjoyed Alice in Wonderland. Harry mentioned he wanted to see more of the Jabberwocky (which is fantastic by the way) but Heidi and Jack had no complaints. As always, the live music that is played on stage by the cast really adds to the experience and is one of the reasons I love Northern Stage Christmas Shows. 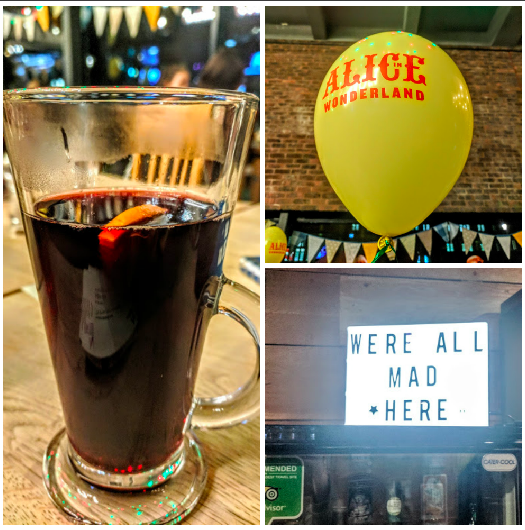 I did really enjoy our evening watching Alice in Wonderland and there were some truly outstanding moments with staging that will keep you on your toes. There's always something new to look at and the show moves at a good pace. Children will adore some of the scenes in the second half and without giving too much away, fits of giggles are pretty much guaranteed. For me though, Alice in Wonderland just didn't have that wow factor that James in the Giant Peach had and just seemed to be missing something that I can't put my finger on. Northern Stage are probably their own worst enemy and they have set the standard so high in previous years and I do think it's tough to maintain this level year after year. If you have tickets to watch Alice in Wonderland, you'll have a fantastic evening. Just make sure you watch with an open mind and expect anything to happen. 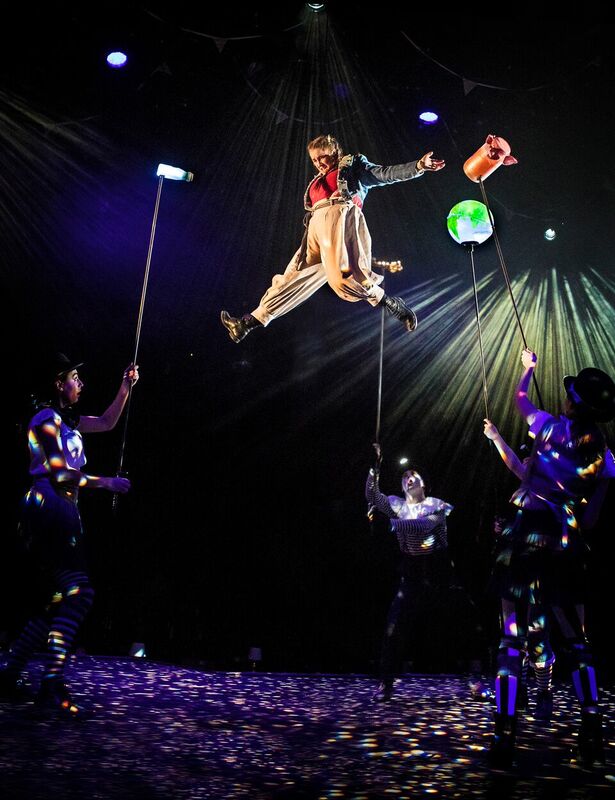 If you don't have tickets despite my couple of criticisms I'd still definitely say it's worth a ticket - even if it's just to watch the Cheshire Cat and Mad Hatter in action, the live music, imaginative staging and of course, the special treat towards the end of the show. Wow I think I might really like this?! I love the photos, it looks so quirky and different to any show on this Christmas!